My sugar coated life...: Purely for research purposes. Honestly. 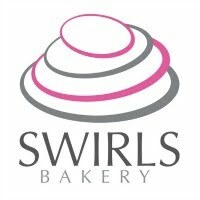 I mean, I wouldn't buy cupcakes from other people unless I was just checking the quality....would I?? Well, yes. 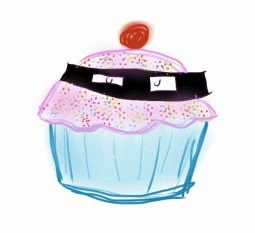 Some people find it very strange that I continue to buy cupcakes from other competitors or that I can still manage to stomach cupcakes after being surrounded by them all day. But I assure you, once you have a sweet tooth its with you for good. And I do recommend you do thorough research of your local competitors or else how else can you know what you're up against? So yesterday I decided to try some cupcakes from a stall at my local farmers market. My heart pounded just thinking about another competitor so close to me but my husband bought a box and we eagerly opened it to try the goods. And what a disappointment. I say this not to diss my fellow cake maker but the sponge was dry and the icing had a weird texture. To conclude my research I asked my colleagues to sample the goods and many refused after seeing my disappointment. There is NOTHING more disappointing than a below par cake. It's practically sacrilege. 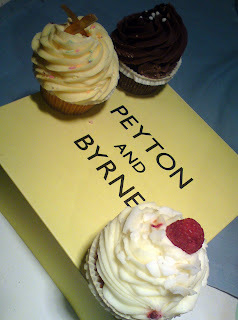 Onto test 2 = So today I was in London and at St Pancras station there is a shop called Peyton & Byrne. I have heard a few people commend them so I bought a box just before catching my train home. They were expensive at £2.50 each but the packaging was lovely and the shop was so nice I didn't mind paying the price. The anticipation ate into me on the train home but I managed to ignore their calling me from the luggage rack above my head and instead waited until I finished my dinner when I got home to tuck in. Verdict - nice moist sponge but WAY too much icing! Now, I don't say this lightly - I am a icing lover but this buttercream was well and truly crusted over and I struggled to take a bite of cake and frosting together. My husband didn't rate them but I liked the chocolate one and have yet to try the others. And besides - he would be bias wouldn't he? And that's why I love him. As part of my new hobby of looking at cake, I can tell you thos others have too much icing. Hahaha, your observations are correct!